I was very sad this morning to hear of the death of distinguished mathematical physicist Dr John M. Stewart (left). Apart from a few years in Munich in the 1970s John Stewart spent most of his working life in Cambridge, having studied there as an undergraduate and postgraduate and then returning from his spell at the Max Planck Institute to the Department of Applied Mathematics and Theoretical Physics for forty years. John’s research mostly concerned relativistic fluid dynamics. Indeed, he was one of the pioneers of numerical relativity in the United Kingdom, and he applied his knowledge to a number of problems in early Universe cosmology and structure formation. I think it is fair to say that he wasn’t the most prolific researcher in terms of publications, which is perhaps why he only got promoted to Senior Lecturer in 2000 and never made it to a Chair, retiring as Reader in Gravitational Physics in 2010. However, his work was always of a very high technical standard and presented with great clarity and he was held in a very high regard by those who knew him and worked with him. 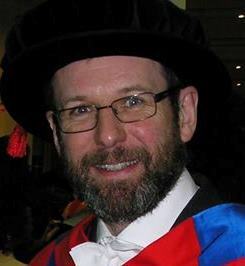 The tributes paid to John Stewart by King’s College (of which he was a Life Fellow) here and his colleagues in the Centre for Theoretical Cosmology here give a detailed account of his research achievements, so I refer you to them for more information about that aspect of his career. I just wanted to add a personal note not about John Stewart’s research, but about something else mentioned in the obituaries linked to above: his teaching. I was fortunate enough to have him as a lecturer when I was studying Natural Sciences at Cambridge during the early 1980s. In the second year (Part IB) I specialised in Physics and Mathematics, and John taught part of the Mathematics syllabus. He was an absolutely superb teacher. For a start he was superbly well organized and had clearly thought very deeply about how best to present some quite difficult material. But it wasn’t just that. He projected a very engaging personality, with nice touches of humour, that made him easy to listen. His lectures were also very well paced for taking notes. In fact he was one of the few lecturers I had whose material I didn’t have to transcribe into a neat form from rough notes. Anyone who has ever seen my handwriting will know that this is about as neat as I ever get! When I was called upon to teach similar material at Cardiff and Sussex I drew on them heavily, so anyone who has learned anything from me about complex analysis, contour integration, Green’s functions and a host of other things actually owes a huge debt to John Stewart. Anything they didn’t understand was of course my fault, not his.. I also remember that John came to Queen Mary to give a seminar when I worked there in the early 90s as a postdoc. I was still a bit in awe of him because of my experience of him in Cambridge. His talk was about a method for handling the evolution of cosmological matter perturbations based on an approach based on the Hamilton-Jacobi formalism. His visit was timely, as I’d been struggling to understand the papers that had been coming out at the time on this topic. In the bar after his talk I plucked up the courage to explain to him what it was that I was struggling to understand. He saw immediately where I was going wrong and put me right on my misconceptions straight away, plucking a simple illustrative example apparently out of thin air. I was deeply impressed, not only by his ability to identify the issue but also with his friendly and helpful demeanour. Rest in Peace, Dr John M. Stewart (1943-2016).